On Friday (Feb 26), the British public will be invited to vote between six entries to represent the UK at the Eurovision Song Contest this year, during BBC Four’s Eurovision: You Decide. 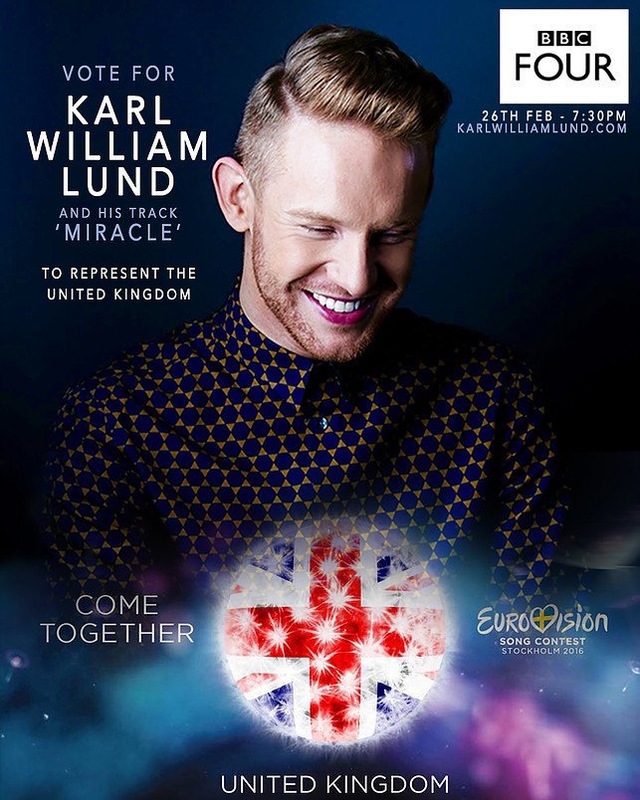 Karl Lund (Singer, songwriter & Model) has been selected from thousands of entrants to represent the UK in Stockholm, with his self written track Miracle. Tell us a little about the song..? ‘Miracle’ found me at an incredible testing time when living and working in Greece in 2012. I worked for an entertainment company and lived with 40+ performers so as you can imagine with all those egos flying around, it wasn’t the best environment to be in. Lyrically, it was about 90% complete in 2012 and I just never got round to finishing it despite friends and family asking me about it. I always believed in the song but something told that it just wasn’t the right time and I had just let it breathe and come back to it. As soon as I heard about the Eurovision opportunity, I very quickly scanned my catalogue of songs in my head and I knew it time for ‘Miracle’ to step into the limelight. Needless to say, I was so overwhelmed and grateful to find out it had been selected as the final 6 for the UK. I think it’s great that we’re all quite different. Music is so subjective and everyone will be rooting for their favourite and I think there’s a great selection to choose from. More importantly, the other acts are genuinely lovely, humble people making this process an absolute pleasure to be part of. Does the enormity of it all not scare you? It does make me want to throw up a little, yeah! But to perform to an audience of 200 million people worldwide, what better platform? I’ve worked so hard over the years to reach this point and I’ve done so without management, without a record deal and I’ve self-funded all of my projects. This would be a massive reward after laying the groundwork for so long. You were also part of Red Hot 100 by Thomas Knights, are you hoping to get the redhead vote? Absolutely, I’m representing the gingers and we can’t ignore the UK ginger success for Eurovision – Katrina being our last winner and Sonia who came 2nd. Who’s your favourite Welsh celebrity? Has to be Ruth Jones. More known for ‘Gavin & Stacey’ but I loved her ‘Nighty Night’. Dark humour as its best! Best of luck for all of us at Cardiff Times!